Call us at for a Custom System on E-Bay! * Unlimited BPA Restaurant Professional Support & Upgrades as defined below in the software description. This system comes with the Restaurant Delivery software installed and all hardware configured. Plug in the cables, turn it on, and you are ready to get started! The included printed manuals and BPA Video Training CD's will help you get online quickly! Use the Video Training CD's to train your employees! All New Hardware carries a manufacturer's parts and labor warranty. Complete Pizza/Delivery systems including used and new hardware. Touch POS Systems with New or Used Hardware! 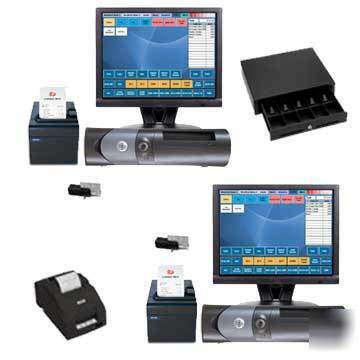 New and Used non-touch POS systems. Add a POS Kit including hardware and software to existing PC's. Your Restaurant Delivery POS System is more than just hardware. Unlike other restaurant delivery systems available on E-Bay, Business Plus Accounting Restaurant Delivery 8.0 is a complete Restaurant Delivery Point of Sale System built on top of a complete business accounting system. This means in addition to running your restaurant floor, taking orders, and tracking deliveries, BPA Restaurant Delivery can help you track your inventory, your accounts receivable, your accounts payable, it can also help you write checks and balance your bank account. It can run your payroll, track maintenance on your equipment, and provide all of your general ledger and accounting reports. BPA Restaurant Delivery also provides over 260 reports! See description of software features below. Be careful who you purchase your Restaurant Software from on E-Bay. We are a software engineering company, in business since 1988. Most of our E-Bay competitors are also selling odds and ends, coins, furniture, etc. They are only selling restaurant software and systems because they recognize it as a profit opportunity. They will very likely be gone when you need support or additional equipment. We will still be selling and supporting our restaurant software long after the others have moved on. * Include up to 14 menus which can be accessed without scrolling through categories. Over 14,000 items can be included in the menu. * Each menu has a unique color to make it easier to know where you are. Items on a menu can be grouped and colored together. * Quick & Easy. One button Quick Sale and One button Quick Cashout functions. Automatically duplicate an item with a single button. * Flexible. Each item can have multiple sides and modifier lists assigned. Modifiers can include pricing. Cooking instructions and other notes can be added. Custom notes can be entered using an on-screen keyboard. Once an item has been entered, you can edit the item and the assigned modifiers. * Assign orders to your drivers and track deliveries. * Close driver orders one at a time or in a batch. * Employees can clock in and out and can log in and out of the POS screen using the touch screen or using employee cards. * Managers can use the touch screen or their manager password card to authorize restricted functions like Voiding Tickets or Comp'ing items. * You can restrict actions that might allow employees to steal from you, such as removing items after a cook's ticket has been printed. * Print reports showing items that have been removed, tickets that have been voided, and items that have been comp'ed or discounted. * Specify which software modules and functions each employee has access to. BPA Restaurant Delivery 8.0 is built on our Business Plus Accounting software package, and includes a complete set of business and accounting tools fully integrated with the restaurant point of sale. * Includes a payroll module which is integrated with the employee time clock. See below for a more complete list of accounting functions! * Integration Eliminates the Chance for Fraud or Error Due to Double Entry. Using Business Plus Accounting software and X-Charge, no re-keying of the sales amount is required. The amount tendered in BPA is exactly what is authorized via X-Charge. This integration virtually eliminates the chance for fraud or error. * X-Charge Consumes NO Counter Space. Counter space is at a premium. X-Charge software runs directly on the BPA POS station replacing standalone bank terminals, reducing the clutter at the checkout counter and providing more valuable space for selling. These few features are just the beginning of what BPA Restaurant Delivery can do. Please see the feature list below for more details! BPA Restaurant Delivery is integrated with our business system, "Business Plus Accounting". Business Plus Accounting was rated by Computer Credible Magazine as being: "By Far The Easiest To Install and Use Of Any Package We Have Ever Reviewed!" If you have out grown QuickBooks this software will work for you. * Quality. Extremely quick, courteous and professional response. Top of the line! This System Includes The BPA Video CD Training Series for Accounting and Restaurant functions. * Supports Touch Screen Entry of Restaurant Orders. * Supports Keyboard/Mouse Entry of Restaurant Orders. * Allows Servers to Print Cook's Tickets. * Allows the cook's ticket to be split between different Cook's printers. You can have up to five different Cook's printers for a single order (i.e. kitchen area, sandwich area, etc.). This saves you the expense of multiple monitors and computers. * Allows You To Print the Entire Order or Just New Items to the Cook's Printers. * Supports use of a cook's monitor at each cooking station with a bump button and cook's ticket printing capabilities. * Allows the manual entry of daily sales, used primarily by Restaurants who use hand written tickets. * Supports Quick Sales For Quick Bar Entries. * Supports Happy Hour Pricing. * Supports Lunch Hour Pricing. * Supports Additional Pricing Options. * Supports On Account Pricing Options. * Supports multiple languages for menu items, for side definitions and for menu names (Supports Chinese, Japanese, Korean, Thai, Greek, Russian, Turkish, Baltic). * Supports Dine In or Take Out. * Supports Discounts For Any Order or any Item on an Order (Password can be required). * Allows Data File Information to be Accessed by Browsing, Reporting, and Filtering. * Allows Data Exporting of All Data. * Supports Bar Code Printing and Scanning for Gift Store Operations. * Show Guest Count Screen During POS Orders. * Exclude an Item From Gratuity. * Exclude an Item From a Meal Discount. * Enable Dine In / Dine Out Option On Quick Sales. * Automatically Print the Cook's Ticket When An Order Is Cashed Out. * Require a Manager Password When Manually Opening The Cash Drawer. * Review a Table Order While at the POS Screen. * Prints Reports Showing Daily Sales, Monthly Sales, Yearly Sales, Sales Per Guest, Tables Per Server, Guests Per Table etc. * Prints Summary Sales Reports. * Prints Daily Sales and Labor Reports. * Prints Table Sales Pre-Posting Report. * Prints Table Sales Posting Report. * Prints Sales Margin Reports. * Prints Monthly Sales Report. * Prints yearly Sales Report. * Prints Remove Open Items Report. * Prints Remove Closed Table Report. * Prints Complimentary Items Report. * Prints Discounted Items Report. * Prints Profit Ranking Report For Sales Items. * Allows you to Assign a Cash Drawer to a Server Station. * Allows Different Tax Rates For Different Items (i.e. Alcohol). * Supports a special tax for items served at the bar. * Supports a special tax for Dine Out or Dine In orders. * Supports Auto Gratuity Calculations Based On The Number Of Guests At a Table And The Percent of Gratuity that You Define. * Supports Manager Adjustment of Server Cash Out. * Contains An Employee Time Clock That Feeds Payroll. * Supports Employee Scheduling and Prints Schedules. * Prints Hourly Sales and Labor reports allowing you to monitor number of employees per gross sales. * Allows Managers to Require Servers to Cash Out with Manager before Logging out of Time Clock. * Allows Employees to Clock Out Without Manager Approval. * Allows Servers to Create Tables and Process Items Belonging to the Tables. * Allows Servers to Split Tickets. * Supports Removing of items from Tickets (Password can be Required). * Allows a table to be transferred from one server to another server. * Allows a Name or Identifier to be associated with a table, most commonly used to track a guest in a bar or night club environment. * Allow Item Removal Until Item Has Been Printed At Cook's Printer. * Assigning a Cash Drawer Number To a Server Station. * Assign Menu Items To a Table Seat Number. * Prints Server Sales and Tips Report Used in Server Cash Out. * Supports Assigning of Drivers to Deliveries. * Prints Delivery Tickets with Addresses. * Prints Box Labels with 1 of 2, 2 of 2, etc..
* Supports dine In, Pickup, or Delivery. * Allows Definition of all Menu Items Including Required Sides, Drink Modifiers, and Cooking Instructions. * Allows Assignment of Items to One or Multiple Menus. * Allows You to Assign Descriptions That Appear on Menu Push Buttons. * Allows Definition of Cooking Instructions. (i.e. Rare, Medium Rare, etc.). * Allows Renaming of side lists. * Allows Definition of Mixing Modifiers for Drinks. * Allows Definition of Special Notes That Can Be Assigned To Entrees. * Allows Unique Special Notes to be entered on the fly. * Allows The Creation Of a Custom Sides List With Custom Pricing For Any Menu Item. This Makes the Selection Of Sides For An Item Very Fast. * Allows a closed table to be opened by the manager. * Supports the Defining of seven table areas with 54 tables per area. * Supports Removing of Tables (password can be required). * Supports Comp'ing of Items (password can be required). * Supports Sale of Miscellaneous Food Items and the assigning of a price to those Items. Requires Servers to Log into the Time Clock Before Processing Tables. * Allows Assignment of Notes to Any Menu Item. * Allows Assignment of Sides to Entrees (When an Entrees Requiring a Side is Selected, the Side Options Pop Up Automatically). * Cook's tickets include all times and all sides belonging to a Menu Item. * Cook's tickets include cooking instructions for items requiring cooking instructions. * Includes a Robust Inventory Management System. * Allows Periodic Cycle Counting. * Prints Cycle Count Discrepancy Reports. * Automatically Adjusts Inventory Based On Cycle Counts. * Prints Reports Comparing Inventory Used In Sales To Inventory Used Based On Cycle Counting. This Helps You Identify Food Waste/Loss and Helps You Correct Inaccurate Recipes. * Supports Daily Inventory Snap Shot Reports. You Can Look at Inventory Quantities For Any Date. Supports Remote Inventory Scanning Using a Hand Held Computer/Scanner and Allows Inventory Updating Based On Scanned Inventory. * Allows You To View a Log Of Manual Inventory Changes To See When Changes Were Made To Inventory. * Prints Food Cost Reports. Shows Item Revenue as a Percentage of Sales. Shows Item Category Revenue as a Percentage of Sales etc. * Tracks Food Waste and Prints Food Waste Report. * Includes a Robust Inventory Management System, With Cycle Counting, with Inventory Discrepancy Reports,with Perpetual Vs Periodic Inventory Reports, with Inventory Snap Shot Support, with Remote Inventory Scanning And with Inventory Change Logging. Supports Equipment Tracking Include Scheduling Preventative Maintenance And Logging Repairs. * Supports Equipment Tracking Including Scheduling Preventative Maintenance and Logging Repairs. * Includes a Retail Point of Sale Module. * Supports Standard 8 1/2 by 11 Invoices. * Prints Statements With Aging Periods. * Prints Past Due Statements. * Prints Aging Letters For Past Due Accounts. * Bar Code Printing (Prints 14 kinds of bar codes including code39 and UPCA). * Bar Code Scanning (Supports all popular bar code types). * Supports Point of sale Cash Drawer, Receipt Printer, and Pole. * Supports Four Levels of Volume Quantity Pricing For Products. * Supports Sales Commissions By Percent Of Gross Profit Margin Or Percent Of Gross, And Allows a Different % Of Commission On Each Product If Needed. * Tracks Order Fulfillment And Prints Fulfillment Reports. * Tracks Product Sales by Department and Product type. * Includes Accounts Receivable System. * Includes Accounts Payable System. * Includes General Ledger System. * Includes Vendor Order System. * Includes Product Receiving Module. * Includes a Comprehensive Payroll System. * Includes a Client Contacting System. * Includes Import Utilities to Allow Importing of Clients From "Select Phone" by SIC Code. Supports Phone Contacting Campaigns Based On Past Sales Or Other Criteria. * Supports Return Merchandise Authorization. * Includes Mail Merge Support For Word For Windows And Word Perfect. * Includes a Custom Report Writing Module. * Allows Bank Reconciliation For Multiple Bank Accounts. * All Modules Are Password Protected. * Includes Over 200 Standard Reports. * This Business System Can Be Run Remotely Using Microsoft Terminal Server And a Phone Line Or It Can Be Run Remotely Over The Web. * Plus Hundreds Of Additional Features. * Supports Hourly and Salary Employees. * Retirement May Be Specified As Taxable Or Non Taxable. * Supports Three Miscellaneous Deductions. * Prints Payroll Cash Requirements Report. * Allows Reversal Of a Posted Payroll Check. * Supports After The Fact Payroll Entries. * Prints Quarterly Summary Payroll Tax Reports. * Prints Payroll Register Report. * Prints Payroll Summary Reports. * Prints Payroll History Reports. Most other systems sold raise the support fees for each additional station and only give you a limited number of support calls. Our support and licensing covers all updates and unlimited software support! As an added service, if you would like us to define your menus for you, we will be happy to do that. It typically costs $500 - $1000 to define your items and create your menus. You can fax or send us your menus and we will give you a quote. * Real Time Integrated Internet E-Commerce Module. * Hospital Staffing Via The Web.